Dan Harris – Dr Dan’s consistency throughout the tournament was a major factor in South Australia lifting its first trophy in a generation. His attacking orthodoxy proved his strength and as the format develops I expect to see more players with keen eyes and classic techniques thrive at the top of the order. Shaun Marsh – The Son of Swampy played second fiddle to Chris Gayle yet still managed 202 runs in four innings at a strike rate of 156. When settled and fit he is a hard man to bowl to as he has the full range of strokes made doubly dangerous by his precision placement and smart cricketing brain. Aaron Finch – His form and ability was recognised by the national selectors and the entire nation witnessed what he is capable of during the second T20 international last month. Victoria had a miserable tournament and most of the time he was either resurrecting the innings or chasing an impossible target yet he still averaged mid-forties at a strike rate of 133. To put his efforts in perspective he more than doubled the aggregate of the next best Victorian batsman. Kieron Pollard – Mostly unstoppable and larger than life there isn’t a ground or a bowler in the country that could contain him. At 23, he is probably the most valuable and gifted T20 cricketer on the planet. He played only four matches, averaged 49 runs at a strike rate of 187 and chimed in with six wickets at a run a ball. Travis Birt – Did a fine job behind the stumps after becoming Tasmanian ‘keeper through Tim Paine’s injury and national selection. He was dangerous with the bat and was a major reason why the Tiger’s middle-order was consistently better than their opponents. Dan Christian – With Harris, Pollard, Ferguson and Borgas in front of him in the batting order the skipper of the national indigenous team never had the chance for a long stay at the crease. He scored quickly when required but it was with the ball where he was most important. He broke partnerships regularly in the crucial period between overs 10 and 16 and with team mates Rashid and Lyon finished in the top four wicket takers in the tournament. Adil Rashid – Started the tournament dropping sitters and bowling tripe and finished it as a star player in a championship winning team. Once he found his feet he opened the bowling with a mixture of seamers, cutters, swingers, drifters, finger and wrist spin and very few found him an easy proposition. His batting and fielding improved too and an argument could be easily constructed as to why he would have made an impact at the World Cup if England had the same confidence in him as Darren Berry and the Redbacks. 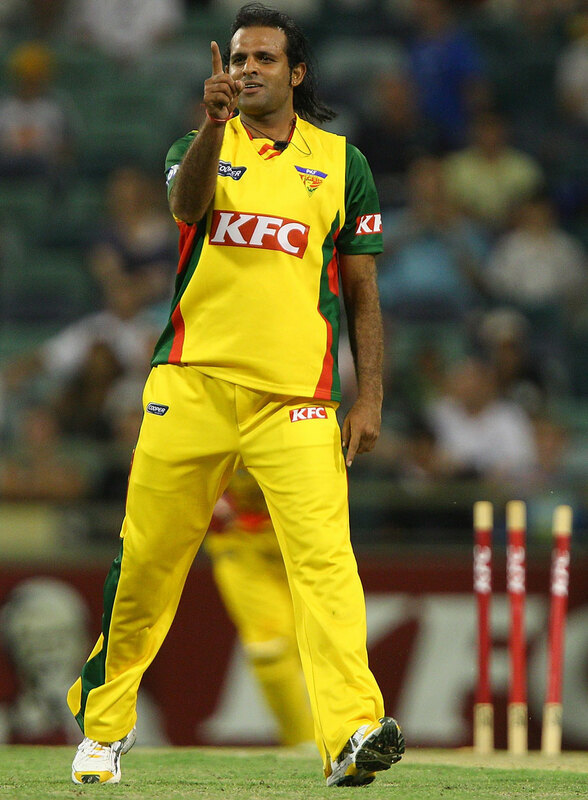 Rana Naved – As crafty as a fox and with the uninhibited flair of a disco king Rana was warmly received in Tasmania and reciprocated with some of the finest death bowling in the Big Bash. His slower ball that bowled Khawaja in Sydney was the ball of the tournament, while his mastery of the yorker, at speeds as far apart as 90 and 145kph, was a lesson to all young bowlers and a significant factor in Tasmania’s success. Patrick Cummins – Only 17, he came into the tournament late yet still managed to top the wicket tally. As you’d expect from a young man in his first foray into State cricket there wasn’t much subtlety in his approach but his tactic of bowling quick and full in the first six overs proved fruitful. Obviously, having Stuart Clark as captain and standing at mid-off throughout helped. Stuart Clark – In T20 cricket economy matters and the old fella was the only frontline bowler to restrict the batsman to less than a run a ball throughout the tournament. He may no longer rush the batsman but his height and nous proved too difficult for most. Additionally, he was the perfect foil for young Cummins and their combination was crucial to NSW making the final. Dave Warner – Destructive and brutal he was The Blues best batsman by a distance. James Hopes – When he played well Queensland did. Nathan Lyon – The Adelaide Oval groundsman was the fairytale story of the Big Bash. Clark as captain? Not best at mid-off, but no doubting his value leading the team, in my opinion. Never thought of a skipper but looking at the team he would be the best candidate. Some familiar and new names to me there. Rashid has bundles of experience, plenty of ticker and no little skill in all three disciplines. He’ll play for England soon surely. Rana Naved (like Yasir Arafat) has been around more blocks than I can count and has learned something every time. Watching Adam Voges (I’m sure not the most talented batsman in Aus) in the 7th ODI made me wonder even more how Steven Smith held down that spot for most of the summer. Steve Smith (like Rashid) may well have enough talent in an all-round package to play international cricket, but surely on merit, he wouldn’t be in the top ten options for the Number Six slot now? Smith wouldn’t be in my top 20 to bat higher than eight. Voges is a very competent batsman and a pretty good skipper when he gets the chance too. I know that stats don’t tell the full story, however Steven Smith scored 772 runs last shield season at an average of 77. He also scored the most hundreds (4) in the competition and also averaged 53 in One Dayers. This enabled him to be voted NSW player of the year. I don’t have Voges’ stats on me for last season but his career average in FC is only 39, coupled with the 10 year age difference between the pair I think the choice was quite simple. I don’t understand why people think Smith has gotten an easy run into the side without any merit? England have lots of players with great domestic stats who don’t have what’s needed for Test cricket. I feel Smith will make it – but not yet. His form at the beginning of this year was trash though. Same with Hughes. And players do lose form/get worked out once they have been around for a while. I don’t like his penchant for playing truly revolting get out shots that he should get a bollocking for – and I would imagine doesn’t – either. I’d have Smith in the white ball national teams as a leg-spinning allrounder. However, as a batsman his technique has major flaws and his temperament, probably because of his age, is suspect. For example, in Hobart during the recently completed ODI series Marsh was fighting tooth and nail to resurrect the innings. Smith came to the wicket and got out second ball having a slog. He did the same thing in Sydney when he had supported DHussey very well but with still 50 odd to get he walked down the pitch and was caught playing a cross-batted hoik. Both times he failed to take responsibility and left it to the tail to get the boys home. I’m not sure what goes on in the dressing room under Nielsen but in my day if a batsman did that he’d be on the end of a serious bollocking from his captain and the senior players. So it appears I’ll never get to see my State play T20 cricket ever again. Sad days indeed. However, it’s good to Krejza going to India. We have picked a pretty aggressive wicket taking squad. Whether it works or not is another question, but I’m pretty happy with who’s going. Mike Hussey will be greatly missed. Part of the allure of the Big Bash was the State v State aspect. In Tasmania the team will be branded Hobart Hurricanes. Not a good idea. It’s going to take a while for the rest of the island to get behind a Hobart team especially up North where they already believe that the capital city gets all the cream and they get the scraps. And I’m not just talking about cricket. The last few months I’ve been pestering the administrators at Bellerive for some answers and I now understand that their hands were tied. They lobbied for Tasmania to remain the branding and the answer they received was that Tasmania v Melbourne or Brisbane would be ridiculous. CA were not prepared to listen. Full stop. I’ve attended every split innings game this season and the format is awful. It’s too complicated and contrived and I’ve had enough of it. There is a match tomorrow and for the first time in about a decade I won’t be attending a Tasmanian match at Bellerive. I never thought I’d be one of those blokes who only attends Shield matches but for the time being at least I think that may be the case. It’s possible that I could give Hobart the benefit of the doubt but only if the local lads are playing. No-one in Tasmania will be happy if Bailey, Hilfenhaus or Paine are playing for another mob on the mainland. They lobbied for Tasmania to remain the branding and the answer they received was that Tasmania v Melbourne or Brisbane would be ridiculous. Yes, it’d be like watching Texas vs San Francisco or New Jersey vs New York or Minnesota vs Green Bay or (utterly ridiculously) Florida vs Tampa Bay or Golden State vs Los Angeles. Even though all those games happen, every year. Ridiculously. As there’s no window for the Big Bash, Australian cricket resources are going to be stretched somewhat. I don’t like the idea of a wndow anyhow (unless it were in November or February), but certainly NSW had to dig deep to find players for this current edition, and now they are supposed to find two teams essentially. At the very least it will give some Grade cricketers a chance to earn a few bucks from their sport. Also, I doubt the still unidentified investors will be content without a window going forward. I expect you’re right. CA are probably softening us up for a paring down of the Shield and for the Test season to be squeezed into December. Something like that.